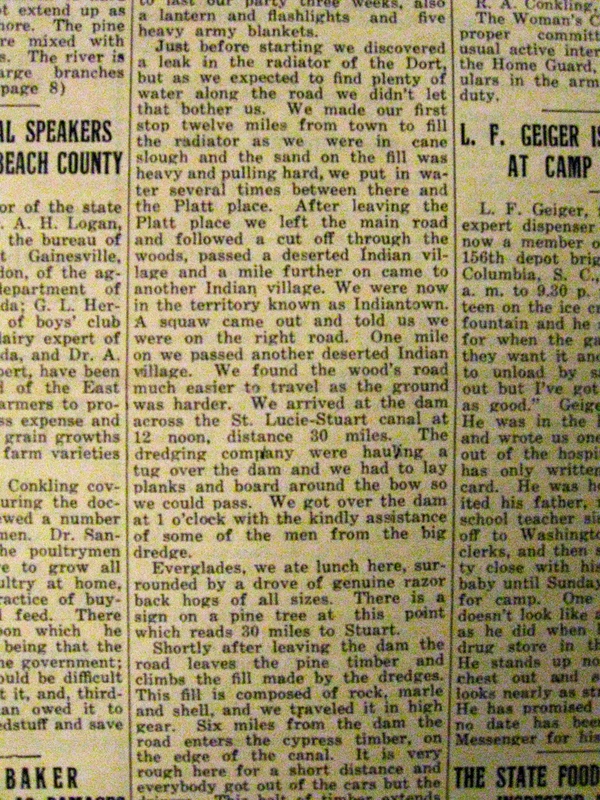 This first hand account of a man who is considered Stuart’s most important business leader, river captain, and pioneer, Stanley Kitching, gives rare insight into what it was like to take a drive to see the new St Lucie Canal, Lake Okeechobee, and the Everglades in 1918. 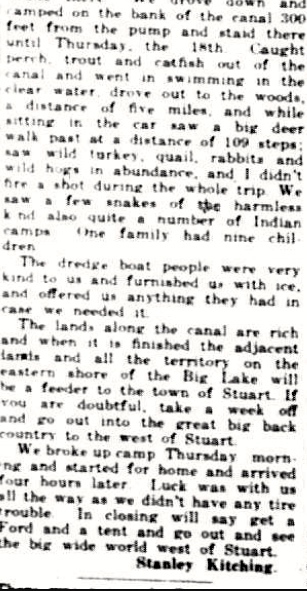 My mother sent her transcribed work first published in the Stuart Messenger, entitled “A Stuart Pioneer Away From Home,” stating: “Jacqui, You might find this interesting. 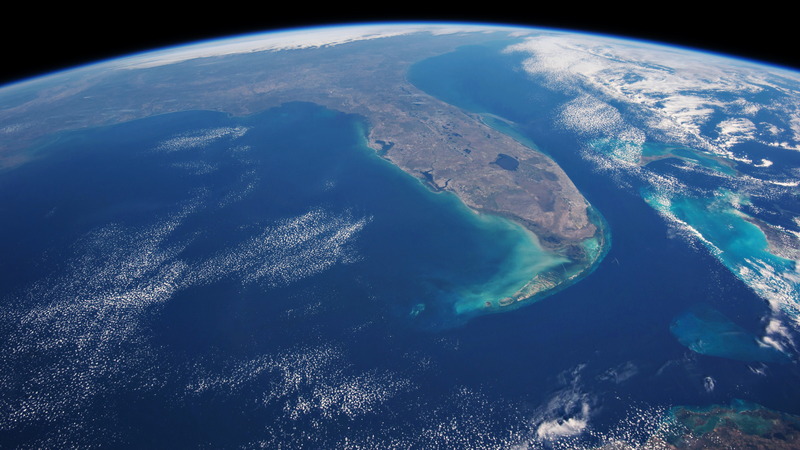 It’s about the Custard Apples.” The custard apple forest was 32,000 acres along the southern rim of Lake Okeechobee that like a giant sieve strained the southern flowing waters of Lake Okeechobee before entering the sawgrass river of the Everglades. 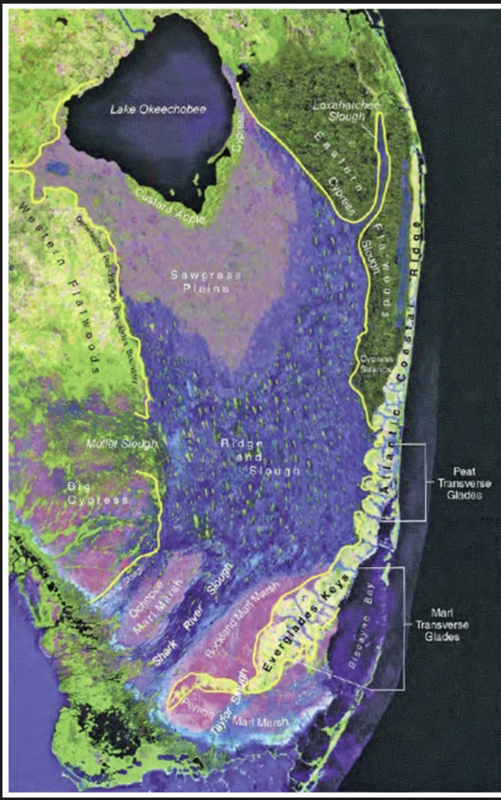 That forgotten forest was demolished to access the very richest of the Everglades Agricultural Area’s famous “black gold.” There are very few first hand accounts of this forest so this article is special. Many other parts of the story will captivate you as well. P.S. 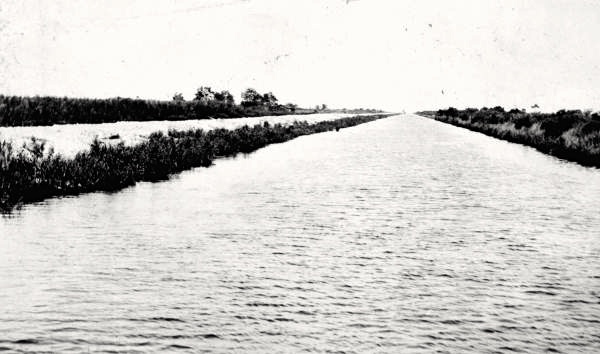 The digging of the St Lucie Canal, (C-44,) from Lake Okeechobee to the South Fork of the St Lucie River, was started in 1915, but not opened until 1923. 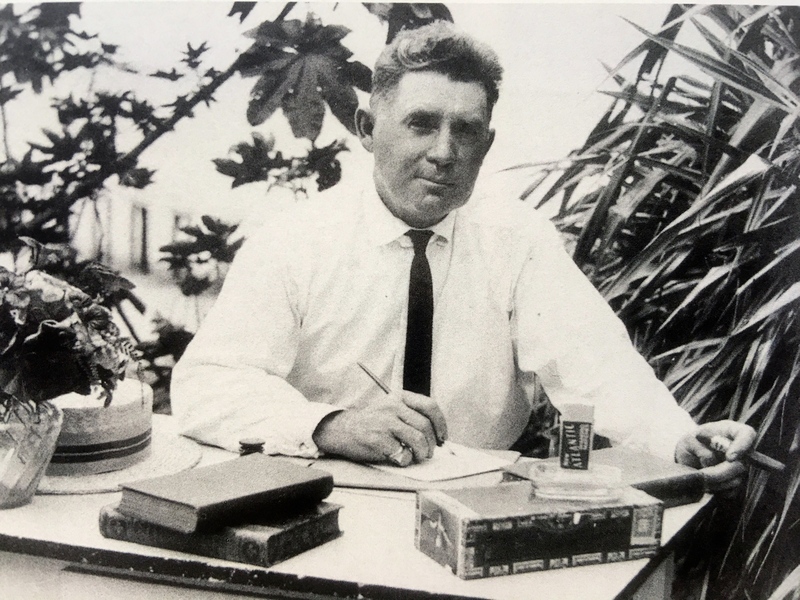 Stanley Kitching, photo Susan Barker Leek, Stuart on the St Lucie page 100, by Sandra Henderson Thurlow. Party Included Mr. and Mrs. Charles Christensen, Mrs. Smart, Mrs. Robinson and Stanley Kitching. 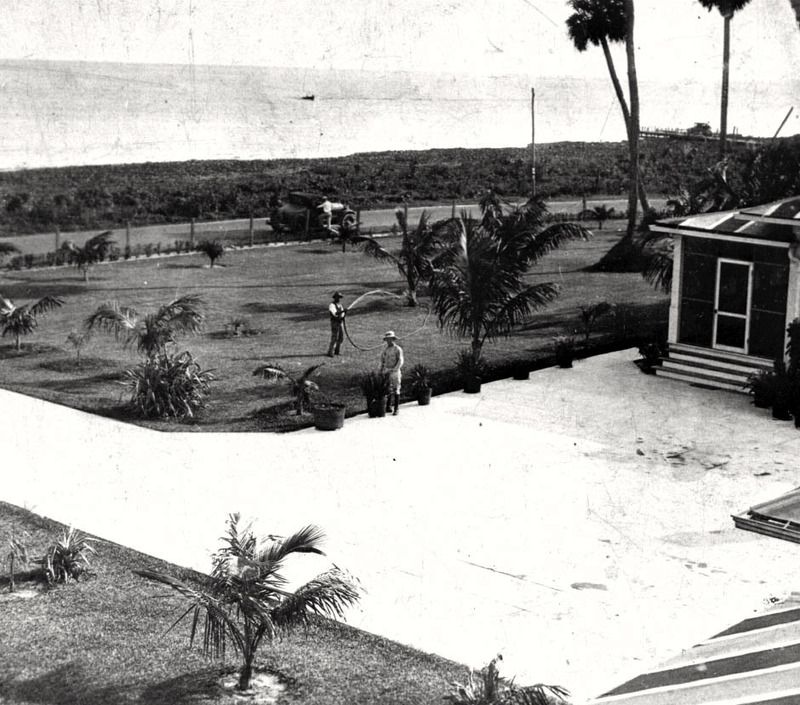 Like a great many Stuart people, we had heard stories about the wonderful Everglades, Lake Okeechobee, the rich soil, bumper crops, and the great Stuart-St. Lucie canal, so on July the Fourth our party consisting of Mr. and Mrs. Chas. 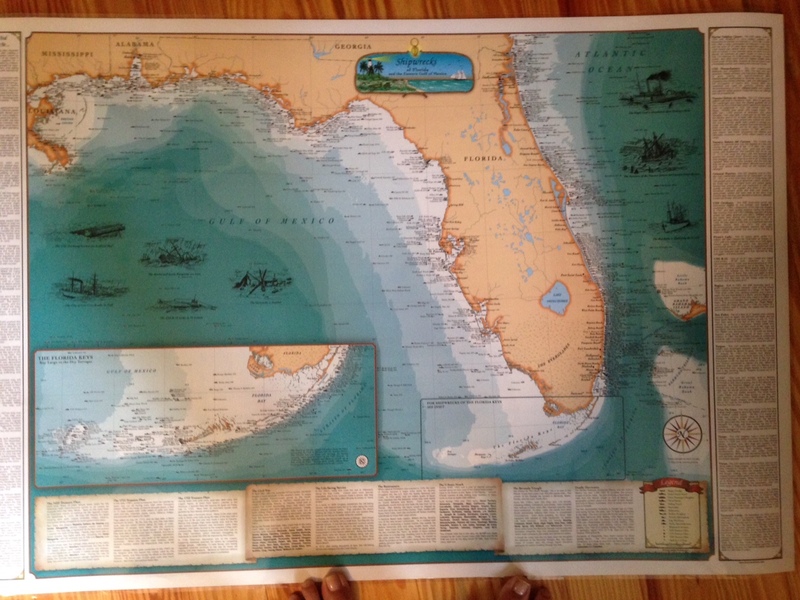 Christensen, Mrs. Smart, Mrs. Robinson and myself started out to see the wonderful country lying to the west of Stuart. We left Stuart at 9 a.m., with two cars, a Ford and a Dart, the Ford in the lead, of course. Each car was loaded to the limit. We estimated the weight in each car to be about 800 pounds. 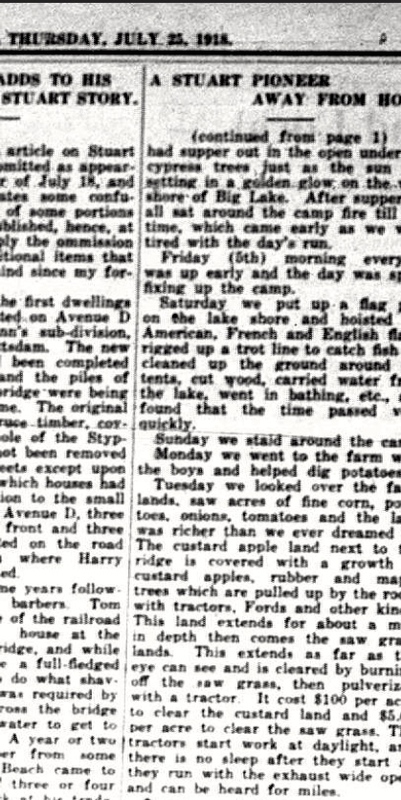 Consisting of tents, cots, cot pads, suit cases, fishing tackle, guns, axes, spade, rope, tent poles, nails, extra tires, gas, oil, spiers, mosquito bar, and enough groceries to last our party three weeks, also a lantern and flashlights and five heavy army blankets. Just before starting we discovered a leak in the radiator of the Dart, but as we expected to find plenty of water along the road we didn’t let that bother us. 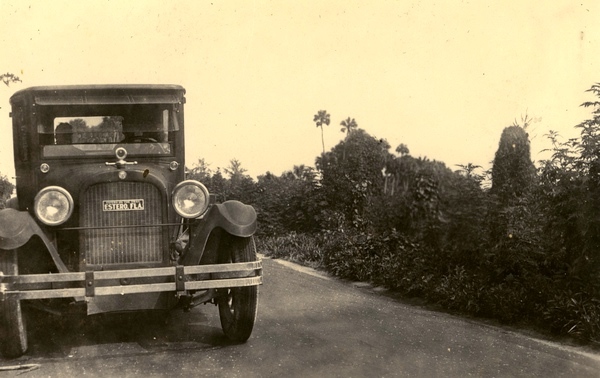 We made our first stop twelve miles from town to fill the radiator as we were in cane slough and the sand on the fill was heavy and pulling hard, we put in water several times between there and the Platt place. After leaving the Platt place we left the main road and followed a cut off through the woods, passed a deserted Indian village and a mile further on came to another Indian village. 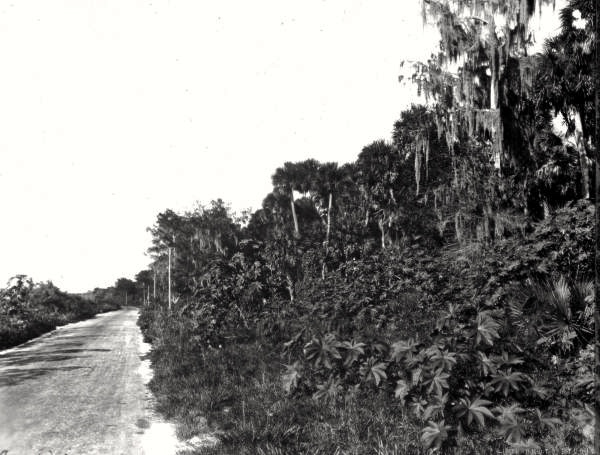 We were now in the territory known as Indiantown. A squaw came out and told us we were on the right road. One mile on we passed another deserted Indian village. We found the wood’s road much easier to travel as the ground was harder. 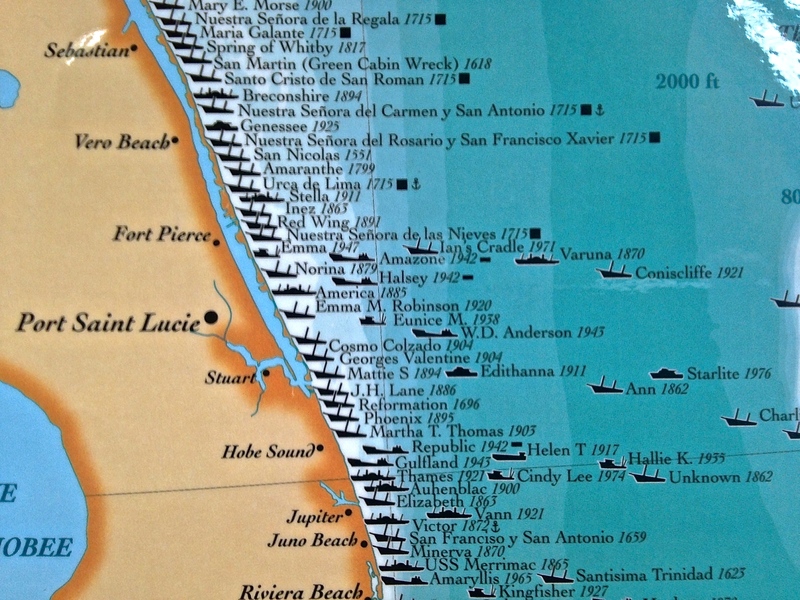 We arrived at the dam across the St. Lucie-Stuart canal at 12 noon, distance 30 miles. The dredging company were hauling a tug over the dam and we had to lay planks and board around the bow so we could pass. We got over the dam at 1 o’clock with the kindly assistance of some of the men from the big dredge. 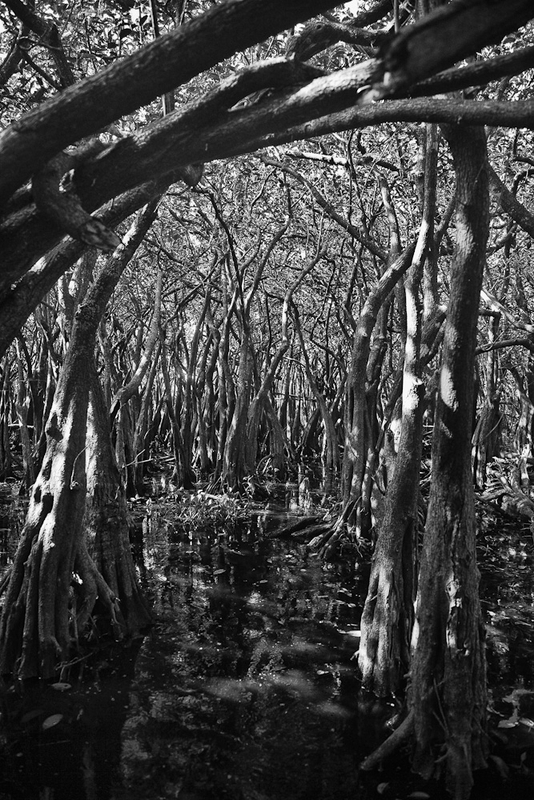 Everglades, we ate lunch here, surrounded by a drove of genuine razor back hogs of all sizes. There is a sign on a pine tree at this point which reads 30 miles to Stuart. 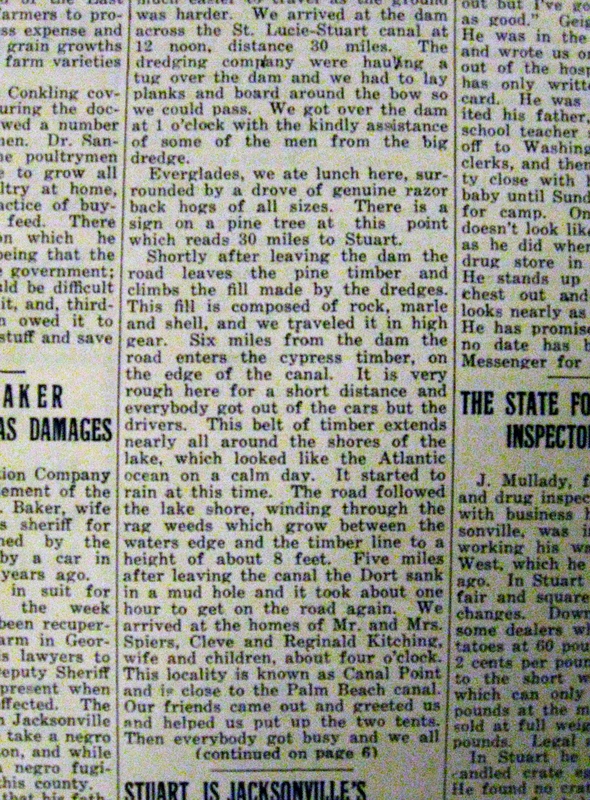 Shortly after leaving the dam the road leaves the pine timber and climbs the fill made by the dredges. This fill is composed of rock, marle and shell, and we traveled it in high gear. Six miles from the dam the road enters the cypress timber, on the edge of the canal. It is very rough here for a short distance and everybody gets out of the cars but the drivers. This belt of timber extends nearly all around the shores of the lake, which looked like the Atlantic ocean on a calm day. It started to rain at this time. 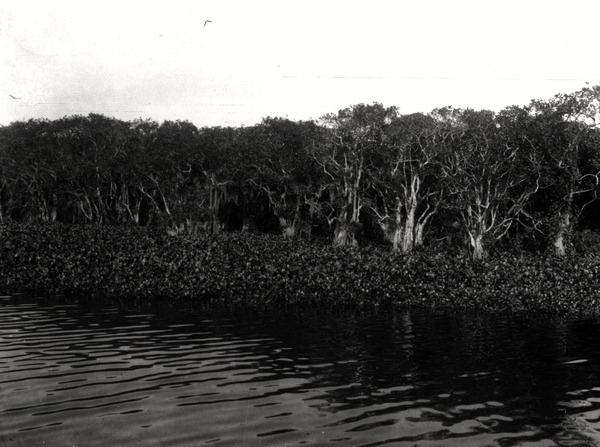 The road followed the lake shore, winding through the rag weeds which grow between the water’s edge and the timber line to a height of 8 feet. Five miles after leaving the canal the Dart sank in a mud hole and it took about one hour to get on the road again. We arrived at the home of Mr. and Mrs. Spiers, Cleve and Reginal Kitching wife and children, about four o’clock. 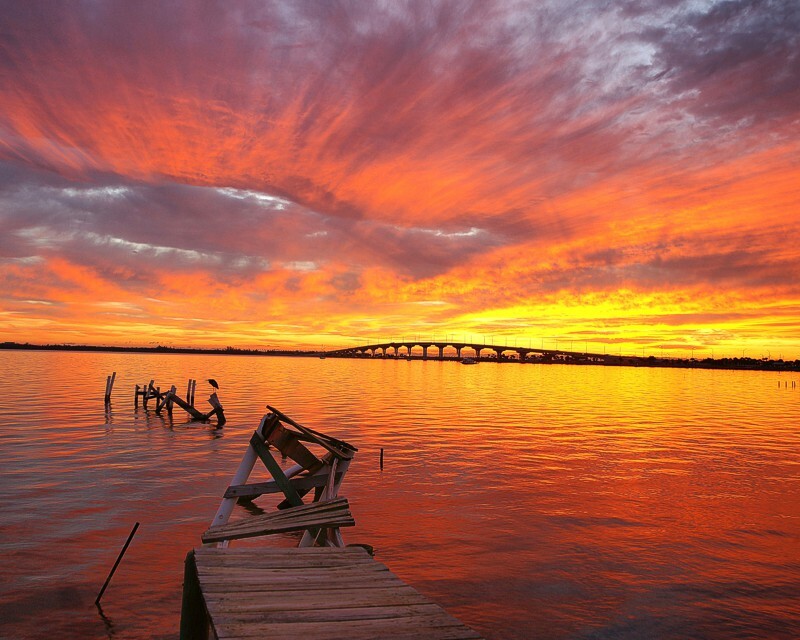 This locality is known as Canal Point and is close to the Palm Beach canal. Our friends came out and greeted us and helped us put up the two tents. Then everybody got busy and we all had supper out in the open under the cypress trees just as the sun was setting in a golden glow on the west shore of Big Lake. After supper we all sat around the camp fire till bed time, which came early as we were tired with the day’s run. Friday, (6th) morning everyone was up early and the day was spent fixing camp. Saturday we put up a flag pole on the lake shore and hoisted the American, French and English flags. Rigged up a trot line to catch fish on, cleaned up the ground around the tents, cut wood, carried water from the lake, went in bathing, etc., and found that the time passed very quickly. Sunday we laid around the camp. Monday we went to the farm with the boys and helped dig potatoes. Tuesday we looked over the farm lands, raw acres of fine corn, potatoes, onions, tomatoes and the land was richer than we ever dreamed of. The custard apple land next to the ridge is covered with a growth of custard apples, rubber and maple trees which are pulled up by the roots with tractors, Fords and other kinds. This land extends for about a mile in depth, then comes the saw grass lands. This extends as far as the eye can see and is cleared by burning off the saw grass, then pulverized with a tractor. It cost $100 per acre to clear the custard land and $5.00 per acre to clear saw grass. The tractors start work at daylight, and there is no sleep after they start as they run with the exhaust wide open and can be heard for miles. Thursday and Wednesday we went fishing and caught some speckled cat fish which were fine eating. Most of the food we used was raised right on the spot, potatoes, onions, Indian pumpkins, butter beans, green corn, tomatoes, okra, rabbits and plenty of fresh milk from Reginald’s fine cow, which grazed along the lake shore and doesn’t cost a cent to keep. There was a pen for branded Berkshire hogs on the place and lots of chickens also a fine pond. Everything on the place was at our disposal and we certainly had a fine time during our stay at Canal Point. We took down our tents Thursday morning and left at 11 o’clock. We reached the dam about 1:30 and spent about one hour working on the roads. After lunch we left the dam and canal and started south through the pine woods looking for a new place to pitch our tents. After going about four miles through and over palmetto scrub, etc. we stopped and dug for water, couldn’t find any, so went about a mile further dug again, same result. Went about another mile and were in what is called Hungry Land. We decided to camp near a cypress pond put up our tents, got wood and dug for water. Found a damp spot after digging five feet and in about two hours we got a pail full of muddy water. We had enough water to make tea for supper, that was all. About ? p.m. we got two pails of water and boiled it on the camp fire, thinking it would settle by morning but it wouldn’t settle , it was real thick so we decided the place had the right name. We were all hungry for a drink so we went to the dam five miles away and got a pail of water. This took three hours. After breakfast we folded up out tents and drove back to the canal. 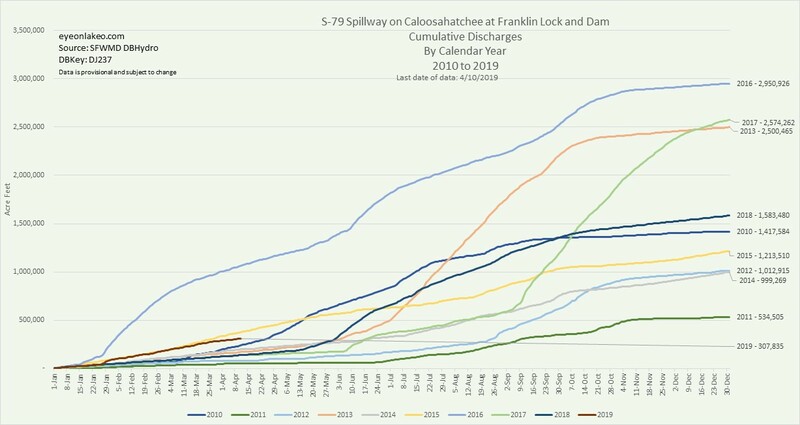 Met Guyler Baker and he said he had a good pump two miles down the canal at his camp and told us to go there and camp and use anything we found there. We drove down and camped on top the bank of the canal 300 feet from the pump and stayed there until Thursday the 18th. Caught both trout and catfish out of the canal and went in swimming in the clear water drove out to the woods, a distance of five miles and while sitting in the car saw a big deer walk past at a distance of 109 steps, saw wild turkey, quail, rabbits and wild hogs in abundance and I didn’t fire a shot during the whole trip. We saw a few snakes of the harmless kind and quite a number of Indian camps. One family had nine children. The dredge boat people were very kind to us and furnished us with ice, and offered us anything they had in case we needed it. 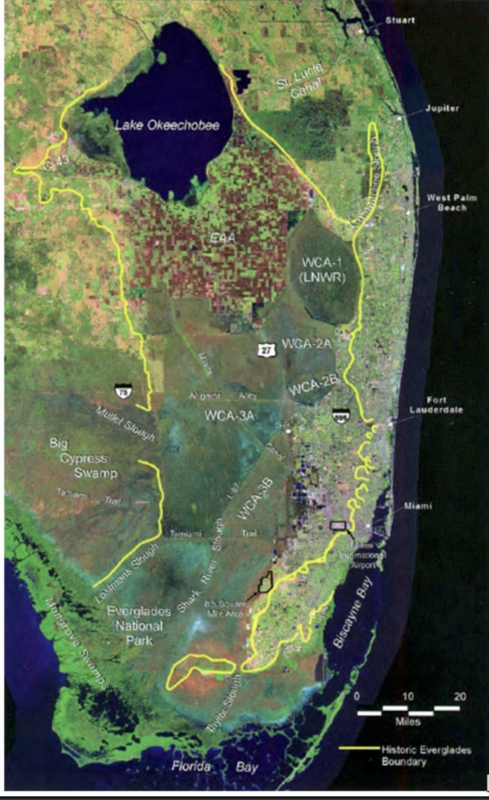 The lands along the canal are rich and when it is finished the adjacent farms and all the territory on the eastern shore of the Big Lake will be a feeder to the town of Stuart. If you are doubtful, take a week off and go out into the big back country to the west of Stuart. We broke up camp Thursday morning and started for home and arrived four hours later. Luck was with us all the way as we didn’t have any tire trouble. 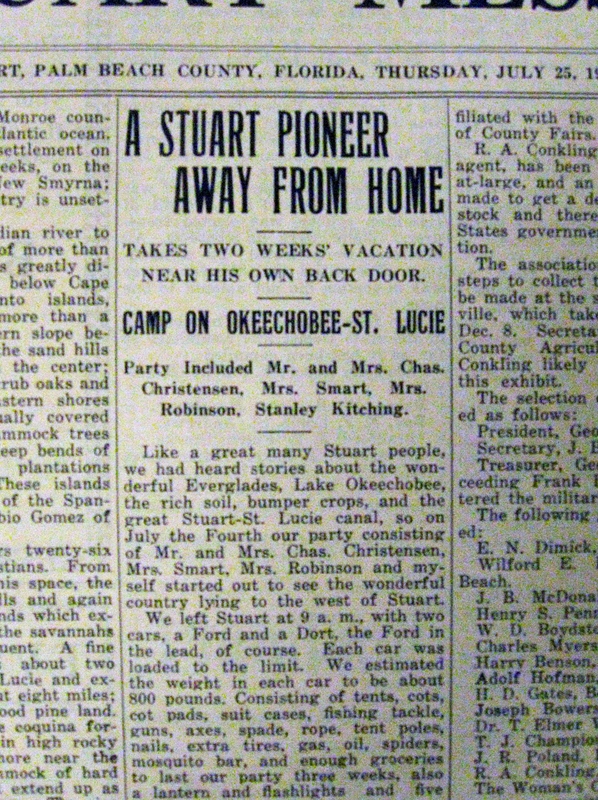 In closing will say get a Ford and a tent and go out and see the big wide world west of Stuart. 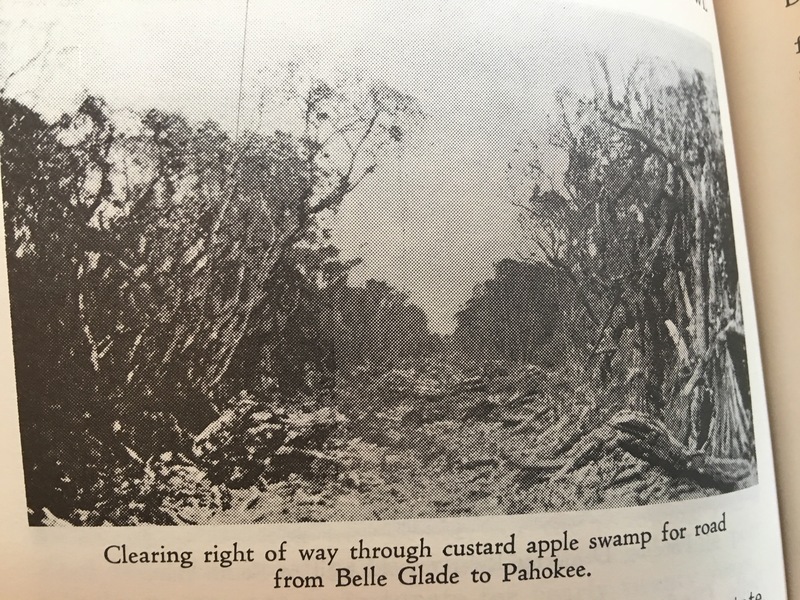 Courtney, Lawrence E Will, from his book Sawgrass to Sugarbowl showing a rare photo of the Custard Apple forest, 32,000 acres, cleared to access rich soils south and around L.O.